1928	Payne		60-No Number	  Pioneer Co.
1938	Delaware	2106 1883X	  S.E. Evans/Virginia Br. The deck truss, which places its supporting framework below the road, made a good choice in cases where enough room existed below the bridge for its truss and where builders desired a more open bridge without the confining side panels of a through truss. In fact, the deck truss permitted engineers to have a wider roadway at somewhat less expense than with a thru truss, providing other conditions at the construction site made a deck truss feasible. When the deck truss became the choice of engineers, it was, in almost all cases, the Warren truss, with or without verticals, that became the design type; the nine deck trusses in Oklahoma make use of riveted Warrens. The Ripley Bridge, though bypassed and currently in disrepair with damage to its concrete railings, makes a superior example of the circumstances that recommended the use of a deck truss. 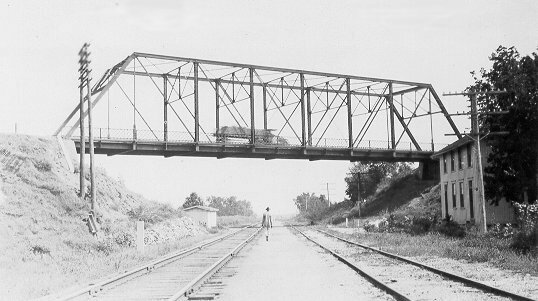 The extension of State Highway 33, east-west through the middle of the state during the 1920s, required construction of a major bridge across the Cimarron River and the Santa Fe railroad that ran alongside the river. The higher gradient of SH 33 taking it above the valley and the beautiful view at this point argued in favor of a deck bridge. The Pioneer Construction Company of Kansas City, one of the new contractors to enter Oklahoma after World War One, built the 978-foot structure, employing eight 100-foot Warrens with vertical supports, and set the bridge atop concrete piers. The Ripley Bridge of 1928 represents the sturdy, streamlined look of the concrete and steel spans that became popular in the 1920s and 1930s to handle the demands of modern traffic (Figure 69). Plans for bridging the Grand River Lake, which was being developed during the late 1930s by the building of the Pensacola Dam near Grove, provided engineers with sufficient height above the water to use deck trusses. The result was the Sailboat Bridge, as it is known locally, a structure consisting of fifteen deck trusses, joined with I-beam spans, that carries U.S. Highway 59 across Grand Lake ("Lake o'the Cherokees'). The project ranked among the largest in Oklahoma undertaken with the assistance of federal emergency funds during the Great Depression (Figure 39). Figure 69. 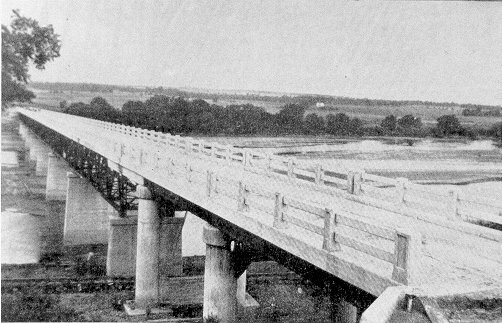 View of the Ripley bridge when it was opened for traffic in 1928.